ევროპაში ჯანმრთელობის სფეროში არსებული გმოწვევების გათვალისწინებით ევროკომისიამ ცვლილებები შეიტანა 2018-2020 წლების სამუშაო პროგრამაში „ჯანმრთელობა, დემოგრაფიული ცვლილება და კეთილდღეობა“ მიმართულებისთვის. BHC-31-2019: Pilot actions to build the foundations of a human cell atlas. BHC-32-2019: Towards a next generation influenza vaccine to protect citizens worldwide – an EU-India collaboration. HCO-15-2019: Support for the functioning of the Global Research Collaboration for Infectious Disease Preparedness (GloPID-R). ასევე, 2018 წელს გამოცხადდება კონკურსები იმ თემებისთვის, რომლებიც თავიდანვე გათვალისწინებული იყო 2018-2019 წლის სამუშაო პროგრამით. ქვემოთ მოყვანილია ამ თემების ჩამონათვალი, ხოლო დეტალური ინფორმაცია თემების შინაარსისა და კონკურსის პირობების თაობაზე მოყვანილია სამუშაო პროგრამაში. DTH-01-2019: Big data and Artificial Intelligence for monitoring health status and quality of life after the cancer treatment. DTH-11-2019: Large Scale pilots of personalised & outcome based integrated care. 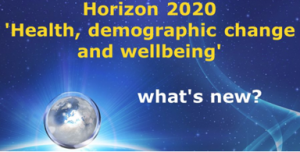 HCC-02-2019: Support for the large scale uptake of open service platforms in the Active and Healthy Ageing domain. BHC და HCO თემებისთვის კონკურსები გამოცხადდება 2018 წლის 26 ივლისს. ორ-ეტაპიანი კონკურსებისთვის პირველი ეტაპი 2018 წლის დასრულდება 2 ოქტომბერს, ხოლო ერთეტაპიანი კონკურსებისა და მეორე ეტაპების განაცხადების მიღება შეწყდება 2019 წლის 16 აპრილს. DTH და HCC ტიპის თემებისთვის კონკურსი გამოცხადდება 2018 წლის 16 ოქტომბერს, და დაიხურება 2019 წლის 24 აპრილის. გამონაკლისია DTH-10-2019 თემა, რომელიც გამოცხადდება 2018 წლის 26 ივლისს და განაცხადების მიღება შეწყდება 2018 წლის 14 ნოემბერს.